If you work in Bay Harbor, or your parent or grandparent works in Bay Harbor, you could qualify for a scholarship through the Bay Harbor Foundation Scholar Program! 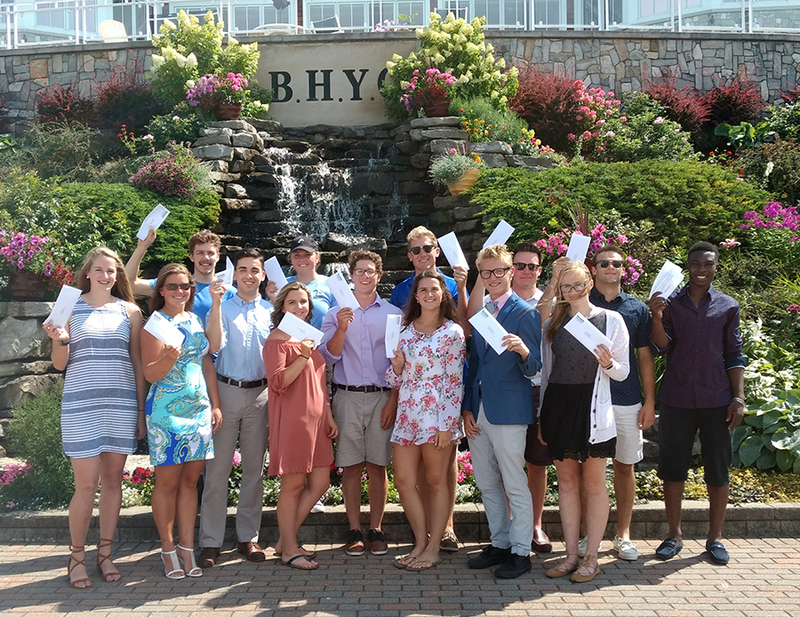 In addition to our grant awards, the Bay Harbor Foundation also serves those who are a part of our immediate community through our Tuition Scholarship Program, which was established in 2008 to provide assistance to individuals working in the Bay Harbor Community to help them achieve their dream of a college education. At least one letter of recommendation from an employer, school counselor, longtime friend, or Bay Harbor Resident who knows you well. A second letter of recommendation is not required, but is strongly encouraged. This scholarship is for tuition only, and funds awarded may not be used for any other purpose. If a student's tuition is already completely paid for through some other means, e.g. from their school, state or federal aid, or another scholarship, that student is not eligible to receive scholarship funding through this program. Please read the Scholar Principles and Application Instructions and follow all instructions carefully. Failure to follow the application instructions may result in your scholarship application being deemed incomplete and therefore inadmissable. Scholarships are disbursed in two installments, and payment on the student’s behalf is made to the college or university at which the student is enrolled. Scholarships are nonreoccuring and awarded annually, but scholarship applicants are invite to reapply each year for as long as they remain eligible. This scholarship has helped me tremendously with the growing cost of college tuition. I am a full time student at Michigan State obtaining an education in Packaging Engineering. With the help of this scholarship as well as working 10 to 15 hours a week while at school, I am doing everything I can to reduce the high cost of tuition at a large university. With focusing primarily on my studies at school, it is very tough to work more than 15 hours a week. This makes me even more appreciative, and I am beyond thankful and grateful in receiving the Bay Harbor Foundation Scholarship. I am extremely grateful for the financial aid that the Bay Harbor Foundation has provided me with for this first year of college. By alleviating some of the stress of tuition, Bay Harbor has allowed me to focus much more on my studies and extracurricular activities at the University of Notre Dame. I have been a sailing instructor and lifeguard at the Bay Harbor Yacht Club for two summers and am planning on returning this summer. I truly enjoy working at Bay Harbor. The close community and friendliness of the members is unique and provides a great atmosphere in which to spend my time. I would like to thank the Bay Harbor Foundation again for their continued support of my education. My time at Princeton University has been an incredible experience for me. Coming from a small town in Northern Michigan, it can be difficult to access and truly understand all of the opportunities that the world has to offer. With the help of the scholarship awarded to me by the Bay Harbor Foundation, I was able to attend the university of my dreams and enhance my future with its numerous opportunities. After receiving the Bay Harbor Foundation Scholarship, it became possible for me to choose Princeton. The scholarship relieved the financial stress of attending this high-caliber (and expensive) university. By providing funds to attend Princeton University, this scholarship opened the door to many opportunities at school. I have immersed myself in the college experience, taking courses to fulfill my degree in Public and International Relations and my certificate in American Studies. I have been able to participate in a number of extracurricular activities. For example, I rowed on the Princeton Lightweight Women’s Crew team, and I am a member of the Relay for Life program on campus. In 2016, I studied abroad in an intensive summer language program in Aix-en-Provence, France. I was submersed in French culture and given an opportunity to advance my knowledge of cultures outside of my own. Additionally, I stage managed shows in the Princeton Theater Department, including the University’s productions of Singin’ in the Rain and Hairspray. I am now a member of the Tiger Inn, one of Princeton’s oldest eating clubs, and the Kappa Alpha Theta sorority. Through the Kappa Alpha Theta sorority, I am able to interact with independent women from all over the world and give back to my community. Thanks to the Bay Harbor Foundation Scholarship, not only am I able to attend the university of my dreams, I am also given access to unbelievable opportunities and experiences. Thank you for the generous scholarship award for the 2017-2018 school year. This scholarship was a huge help to me for paying for tuition. I worked 3 jobs this summer in order to be able to pay for school, so any extra aid I can get is tremendously helpful. My first semester at Michigan was incredible. I'm very thankful to be surrounded by such a diverse array of talented, hard-working students. All of the friends I've made at school so far continue to keep me motivated in my studies. I loved all of my classes this semester. I took my first class in international law and made the decision to major in either PPE (Philosophy, Politics, and Economics) or Public Policy, and to pursue law school after my undergrad. I truly can not express how much of an impact reviving this scholarship has made on my time at Grand Valley. Paying for school on my own is rather challenging at times, and the monetary support the Bay Harbor Foundation has provided is truly a blessing that makes it possible. It means so much to work for a community that cares so much to help us as students work towards our goals of higher education, it means more then you could know, thank you so very much. The Bay Harbor Foundation Scholarship has been an extremely beneficial component to my college education. Paying for college is bound to be difficult, especially coming from a family without a high income. Organizations such as this truly make an impact on the college cost burden. This impact has allowed me to focus more and my studies while worrying less about the financial side of a college education, and I am forever grateful for the scholarship. I would like to thank the Bay Harbor Foundation for the generous scholarship they have provided me. Due to the scholarship, I have been able to reduce my student loans and ease my current financial situation. The piece of mind that I have the support of others for my education is very reassuring and I will be forever grateful. Through hard work and dedication to my studies, I will once again be selected to be on the Dean’s List at Michigan State University. I am currently going into my final semester studying supply chain management and am excited for future endeavors to come. I will continue my hard work and make good use of the scholarship I receive to further assist my education. I would like to again say thank you for your support throughout my college career. I value my education at Michigan State University and it’s nice to know that people from my workplace, and hometown are up here supporting everything I do. This scholarship allowed me to be a little less stressed out financially and allowed me to focus more on my studies. This being my senior year, I am getting more involved and into intense classes and I was able to persevere by knowing I had help from people back home. I will hopefully be continuing my education after graduating this upcoming spring, and I am glad that this foundation was able to be right there with me while finishing up my undergraduate college career. I will forever be grateful for this scholarship and for knowing that others believe in me. I hope to one day be able to give back and make others feel as much gratitude as I do from receiving this scholarship. The Bay Harbor Foundation Scholarship has assisted me with the means to complete my academic goals. The financial support I received through this scholarship also allowed me the opportunity to complete other academic objectives, such as internships, academic travel and more that I would not otherwise have been possible. The service and support I received from the Foundation gave me the freedom to excel academically and financially. Thank you for what you have offered me. I appreciate it. This scholarship has helped me tremendously in the ability to afford an education at Michigan State. I have always wanted to go here and with the Bay Harbor Foundation Scholarship, I did. This past semester has taught me much about work ethic, what I want to become in my future and that things always work out for good people. It has taught me that the world is a good place with good people that want to help each other succeed. If I hadn't gotten this aid, I would've had to figure out some sort of loan, which would cost me a lot in the long run. I am so thankful that I was chosen to be one of the students that were aided. I love my school, the friends I have made, and my education. Political science has proved to be the field for me within these few months at school. Yet again, thank you, I appreciate everything that this scholarship has allowed me to do. The Bay Harbor Scholarship is very beneficial towards my schooling. It has helped me financially to attend the college of my choice so, I can continue on my path to success to pursue my goals and dreams. This year’s fall semester at Michigan Tech is complete. The scholarship I received helped lighten the burden of my semester loan and made it easier to afford textbooks. Now that I live off campus, expenses really add up. I realize the importance of every dollar. I can’t thank the Bay Harbor Foundation enough for helping me with the high cost of tuition. The classes I am taking will prepare me for a job in Mechanical Engineering. Classes are difficult, but I know the struggle will be worth it. I will return to Michigan Tech in a few weeks. After second semester I plan to return to Bay Harbor for my third summer. I enjoy working with the staff and serving the needs of the Bay Harbor members. I appreciate the scholarship. Thank you for placing your trust in me. The Bay Harbor Foundation Scholarship has been instrumental in my success so far at college. The most significant effect was on the amount of money I have been able to save, and in turn my ability to apply to graduate schools with less worry about finances. The scholarship has allowed me to focus on my education first, and not have the burden of as many college loans on my mind. The Bay Harbor Foundation expects great things from all the students it awards scholarships to - this is just another force that encourages me to put forth by best effort, day in and day out while in college. I am very grateful to the Bay Harbor Foundation for awarding me a scholarship for this school year. This was my first semester in the Nursing Program at Grand Valley. It takes a huge weight off my shoulders to have this scholarship so that I can focus more heavily on school and worry less about finances. I am very excited for my future career and would not be able to pursue it without the Bay Harbor Foundation. This scholarship has been a huge help to me. I have recently taken on all of my financial responsibilities due to some family issues. This scholarship has been able to allow me to focus more on my studies than on working crazy amounts of hours while at school. Even though I have worked while I am a full time student the last 3 semesters, I will not be able work as much this coming semester. I am taking more credits and having surgery in the end of January. This scholarship will help ease my mind while recovering know that it’s just another expense I won’t need to worry about as much. Below is a listing of the funds awarded in 2018 through our Program and Grant cycle, Partnered Events and Directed Donations. Statement of Need: Challenge Mountain is in need of some adaptive bikes to be used on their trails as well as the other trail systems in northern Michigan. Due to the cost of adaptive equipment their clients cannot afford this sport. They are proposing to purchase the equipment for use by their clients. Bikes for adaptive needs run in price from $2,000 - $12,000 depending on the type and what kind of trails they are built for. Their first goal is to purchase a tandem bike for use with children and blind persons who need a guide. They would also like to purchase a hand powered, tri-cycle for use by paraplegics or amputees. Both of these bikes can be used on mountain trails as well as paved trails. Mission Statement: The Charlevoix Area Hospital Foundation is a non-profit organization set up to raise, manage and distribute donations to support the mission of the Hospital and the people we serve. Statement of Need: The Charlevoix Area Hospital Foundation is requesting funding to equip nine schools in our region with the supplies and equipment they need to fully implement the School Nurse Project initiated last year. The Charlevoix Area Hospital has hired and placed registered nurses within area schools on a timeline as appropriate for each district/school. After several meetings with school superintendents and principals, they report that all are enthusiastic about the real potential for great service to our school aged children throughout the county. To date, nurses have been placed in the following area schools: Charlevoix, East Jordan, Northwest Academy, St. Mary’s, Ellsworth, Bellaire, Central Lake, Boyne Falls and Boyne Concord. The Charlevoix Area Hospital Foundation believes that healthy children are successful learners. The school nurse has a multifaceted role within the school setting, one that supports the physical, mental, emotional, and social health of students and their success in the learning process. 1. Improve the overall health of the children served through screenings, nutritional counseling and other related wellness offerings. 2. Provide experienced, qualified health professionals on site to assist in the diagnosis and treatment of minor ailments, accidents, etc. 3. Provide counsel to teachers to help them watch for health warning signs in their students, manage medication distribution and assist with wellness for teachers as well. Mission Statement: To promote the well-being of the young people of Northern Michigan…without regard to race, religion or political affiliations. Statement of Need: The Christ Child Society is requesting funding to help provide food and clothing, including boots and shoes, as well as toys and gifts, to local children in need at Christmastime. The Christmas Shopping Project is an on-going, member-intensive endeavor. Committee Chair, Monica Crawford, coordinates a large group of the Christ Child membership who, with "wish lists" in hand, shop for local children each Christmas season. More than 50 "shoppers" participated last year, volunteering their time for this holiday project. Amount Recommended: $3,000.00 – Further funding waiting for 501 (c)(3) determination status from the IRS. Grant funding will be put into escrow until status has been confirmed. Mission Statement: The mission of Northern Community Mediation is to help people in Charlevoix and Emmet Counties resolve conflicts. CDP cases protect children who have been victimized through abuse and/or neglect. CDP cases that go through mediation rather than the formalized, court process are settled 14 to 17 months sooner. While placement is being determined, the child is placed in foster care. The cost per child per day ranges from $25.00 to $49.22. For 14 months, this calculates between $10,625 and $20,918.50 per child. For 17 months, the cost ranges from $12,875.00 to $25,348.30. Based upon an average cost per child per day of $37.11, the cost for 63 children in foster care per year is $853,344.45. Equally as important as the financial savings, however, is the emotional well-being of the child. Common sense, as well as psycho logical research, indicates that children who have a permanent home have a greater sense of security than those who do not. Additionally, the Child Protection Mediation process helps the biological parents adapt so that they do not necessarily lose their parental rights. When parental rights are terminated, however, the parents gain insight into the fact that what is happening is in the best interest of their child or children. Mission Statement: To create, stimulate and perpetuate the arts in Northern Michigan. We offer exhibits, concerts, classes, lectures, special events and so much more. Statement of Need: The Crooked Tree Arts Center is requesting funding from the Bay Harbor Foundation’s support of the 2013 Youth Arts Scholarship Fund of the Crooked Tree Arts Center. A grant from the Bay Harbor Foundation would provide scholarship support for all of the arts educational opportunities offered by Crooked Tree Arts Center (CTAC) throughout the year. Over 800 students are enrolled in music, art, literary, theater and dance programs each year. The Educational Program reaches all ages, and families of all sizes. On average, the level of income for families applying for scholarship support is less than $25,000 per year. The average fee to enroll in a 17 week dance class is $220, and families earning less than $25,000 pay $55 for the class, with the CTAC Scholarship Fund providing the balance of $165. The rental cost for a violin is $16 per month, and a family qualifying for a 75% scholarship pays $4 per month. The Arts Center is proud of the achievement of the students. The dance program has garnered national awards and recognition as well as individual dancers. The Youth Orchestra has provided advanced training for students as they embark on their college careers in music performance and music education. Scholarship assistance would not only help these high achieving students, but also the beginners in all of the classes offered by CTAC. Mission Statement: Our mission is to ensure that all senior citizens have the opportunities, information and services necessary to live healthy, safe and active lives in dignity. Statement of Need: From the 2000 to 2010 census, the number of older adults in Emmet County has increased by 31%. Many seniors try to survive on Social Security, which often times is not enough to maintain the normal expense of living, let alone emergency expenses, making them especially vulnerable when unexpected challenges arise. Emmet County residents age 60 and older, often seek out the Friendship Center as a primary source of information and assistance. Many view FCEC as their first stop for help. The needs of our senior community are varied and great. Since the Senior Essential Needs Fund's genesis in 2009, FCEC has been able to assist financially disadvantaged seniors with a wide variety of emergency needs, from the repair of a failed well system to furnace replacement and vehicle repairs, as well as support for seniors on a limited income overwhelmed with prescription costs, mortgage payments, and other expenses. Having this Fund allows the FCEC to provide the help that is needed when all other avenues of financial assistance have been exhausted. FCEC's objective in replenishing the Senior Essential Needs Fund is to stand ready to confidently address senior needs as they arise. This alternative source of funding for area seniors empowers FCEF staff to reach out with resources that are otherwise not available. Receiving a grant in the amount of $5,000 would allow FCEC to respond quickly and effectively to help seniors who face unexpected hardship. Mission Statement: To produce live orchestral performances providing entertainment, education and inspiration for our northern Michigan community. Statement of Need: The Great Lakes Chamber Orchestra would like to produce a concert in Bay Harbor. This would be a live orchestral performance providing entertainment, education and inspiration for our Northern Michigan and Bay Harbor community and will continue to build the relationship and audience between Bay Harbor and the GLCO by providing world-class music right here at home. These funds will be spent on contracted services for the Professional musicians, Guest Conductor and the GLCO support staff in preparation and implementation of this performance. The arts are critical to a healthy and vital community. Great Lakes Chamber Orchestra fills an important role in providing high quality arts experiences. The response to community need for the arts has been addressed dramatically by the Great Lakes Chamber Orchestra past performances and community outreach activities. The GLCO is centered in the Little Traverse Bay area but serves a significantly larger geographic area that includes cities, towns and villages from Traverse City to the Mackinaw Bridge and from the Lake Michigan coast at Charlevoix to Alpena on the shore of Lake Huron. Mission Statement: To assure that not one person in our distribution area is hungry. As a warehouse, we distribute to pantries in Emmet, Charlevoix and Antrim Counties. Visitors to those pantries receive food products at no charge. 1.) To improve the nutritional content of food items offered to the children while staying within the other parameters of the program: kid-friendly both in taste and ease of preparation; shelf stable food items; remain budget-conscious to keep the overall cost of the program in line. It is expected that the improvement in the nutritional value of the food items is going to increase the cost of the program. Although food items received from Feeding America West Michigan Food Bank, the major supplier for The Manna Food Project, are very inexpensive, many are considered to have poor nutritional quality. The Manna staff is working with several area businesses and wholesalers to secure special pricing on large quantities of items needed for the program. 2.) To make sure the program is available and utilized by all schools in Emmet, Charlevoix, and Antrim counties. There were a couple schools not participating in 2011-12 due to staffing challenges. The Manna Food Project has since identified volunteers who will help the schools with the distribution of backpacks. New Head Start sites will also be joining the program for 2012-13. The goal is to make sure that no one in northern Michigan is going hungry due to lack of food. In 2011, over 2,050,000 pounds of food was distributed out of The Manna Food Bank through pantries to families needing assistance in our 3-county service area. Mission Statement: To inspire young people to be science and technology leaders, by engaging them in exciting mentor-based programs that will build science, engineering and technology skills, that inspire innovation, and that foster well-round life capabilities, including self-confidence, leadership and communications. The US FIRST robotics program brings an element that has been missing in our education program. It affords students the opportunity to have hands-on experiential learning in the STEM disciplines (science, technology, engineering, and math). It gives them the leg up that other schools downstate have had for years. It allows the students to apply what they are learning in the classroom to real-life situations, and exposes them to new college and career possibilities. The FTC team at the middle school has 18 opening this year and the FRC team at the high school has 30openings for students. Each team also participates on the marketing pieces of the program, such as doing demonstrations at schools and businesses, maintaining a team webpage, communicating with other teams from across the country, and even simply cheerleading and spreading the word about FIRST robotics. The goal of the program is to engage students in mentor-based programs that build science, engineering and technology skills, that inspire innovation, and that foster well-rounded life capabilities including self-confidence, communication, and leadership. This is the second year for the Middle School Team G3 and the third year for the High School Team Paladins. Mission Statement: Second Chance Ranch and Rescue exists to provide assistance to neglected or abandoned horses and other large farm animals in Northern Michigan. When resources are available, we also offer assistance to large animals whose owners can no longer support them due to financial hardship. SCRR also strives to educate the public on the importance of population control, preventative health care, and training of large animals. Statement of Need: SCRR is a nonprofit organization dedicated to the rescue and rehabilitation of large animals in Northern Michigan. Animal control seizures are our first priority, but when resources and space permit we also accept neglected or abandoned animals brought by private citizens and animals whose owners can no longer care for them due to financial hardship. They are not the humane society. They do not accept animals just because they are unwanted or have become an inconvenience. They do not accept baby animals because they were ‘unplanned’. They are not a ‘no kill’ organization. Unfortunately, with large animal rescue the saying ‘you can’t save them all’ applies. Animals that are determined to have painful, incurable medical conditions or those large animals determined to have emotional and social issues that are not amenable to rehabilitation are humanely euthanized. They do NOT euthanize due to overcrowding issues. SCRR only accepts animals that it has the resources to support. The Michigan Horse Welfare Coalition has told SCRR that they are one of only two rescues in the area with space available. They have a supportive board and space available and our support will help us feed these malnourished animals. Mission Statement: The Women’s Resource Center of Northern Michigan is committed to equality, justice and the well-being of women. To that end, we will engage our community and encourage all to work with us toward those goals. Statement of Need: The purpose of this grant request is to provide Children's Learning Center scholarships to reduce the childcare costs for working single mothers and low income families which is often the catalyst for them to maintain their employment and/or continue their education to obtain/maintain self-sufficiency. The goal of the project is to provide an opportunity to reduce the childcare costs of working single mothers and low income families which is often the catalyst for them to maintain their employment and/or continue their education. It also gives them peace of mind, knowing their child is protected and nurtured while in our care. The CLC offers childcare to all enrolled families at a lower cost than most facilities, in an effort to realize the agency's vision to give the highest quality educational programming to all that enter. But as the financial challenges multiply for the families they serve, it becomes increasingly more difficult for parents to pay for childcare for their children. The struggle for single mothers to provide for their families is often the hardest, as they alone are responsible for all that their family needs. Annually, the CLC provides services to about 100 families. The service is fee based and each family enrolls their child based on their individual needs. Historically, the WRC has found that about 15-20% of their enrolled families may require scholarship assistance for various reasons at some time during a year. Every family contributes to their daycare cost, and based on family need and circumstances scholarships ranging from S25 to $100 a week may be granted. CLC scholarships have been supported annually using various direct funds that have been granted to the agency through private donors, a family foundation, civic groups and a giving circle fund. Each year for the past two years. $6.000 has been distributed. This grant application seeks $3,000 to offset funding from a source no longer available. Ongoing funding of this project will continue to be supported by private donations. Letters of Intent for the 2019-20 Grant Cycle are due on June 1st, 2019. Our program and grant cycle begins with the sumbission of a Letter of Intent. Our Program and Grant Committee reviews the Letters of Intent and selects organizations to submit full Grant Applications. Organizations will be given approximately one month to submit their Grant Application. After the Program and Grant Committee has reviewed the Grant Applications, applicants will be asked to participate in an interview to answer any further questions about their proposal. The Program and Grant Committee then recommends grants to the Board of Directors for their approval. Approved grants are funded during the following calendar year. For example, grants sumbitted in 2019 will be funded in 2020. Organizations that recieve grants are required to submit 6-month and year-end progress reports to update the Foundation on the status of the project or program for which they have received funding. 1. The mission of your organization. 2. What your organization does. 3. A brief explanation of how this grant would benefit your organization. 4. How this project will fit into the Bay Harbor Foundation’s mission to improve the quality of life experience. 5. The purpose of the project for which funds are being requested. 6. A brief description of how this project will impact our community and your ability to pursue your mission. 7. A preliminary budget and a 2018 Project Schedule. Please also provide a copy of your Form 1023 and your current Charitable Solicitation Registration. If you plan to submite your Letter of Intent by email, please scan and send it, and all neccesary attachments, in a single combined pdf file. Organizations that are asked to submit a full grant application must complete the Grant Application Form, below, and provide all of the required attachments. Organizations receiving funding are required to submit a six-month progress report and a final year-end report. In addition, we also require that these organization provide a copy of their Charitable Solicitation Registration Certificate if they raise funds of more than $25,000 annually, and a copy of their Form 990.